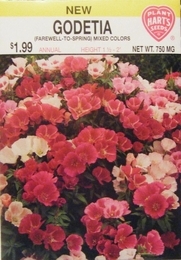 Easy to grow from seed, these annuals produce delicate blossoms with watercolor like markings. Native to North America, it was discovered by Capt. William Clark (1770-1838) during the exploration of the Louisiana Purchase. Prefers full sun and poor soil as too much rich compost or fertilizer will result in lush foliage with few flowers. They thrive in the cool temperatures of spring.